In this form Durga is four-armed and rides a donkey. She carries sword, trident and noose. With one hand she blesses. In this form she is dark and repulsive in appearance. She is cruel and excited. 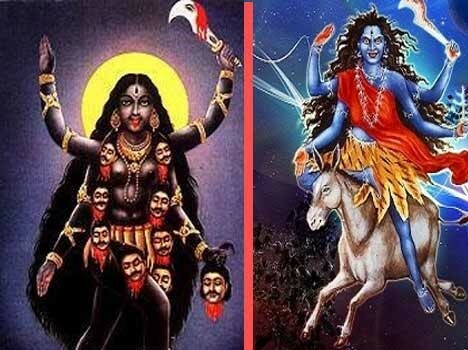 This is the violent and dark side of Durga. This form primarily depicts that life also has dark side. Kalaratri is worshipped on seventh day of Navarathri. Her person is like the dense darkness and is absolutely black. She possesses three eyes in her forehead which are as round as the universe itself. The hair on her head is very dense but disheveled. She is bedecked with a glorious garland round her neck which emits great refulgence. She breathes out horrible and terrible flames of fire. Although her person is absolutely black yet refulgent rays keep on emanating from her. Although the outward form of Mother Kaalaraatri is extremely frightening yet she always bestows boons on her devotees. So, she is also called Shubhankari as she always brings about the welfare of her devotees. All sins are washed off by her adoration and worship. Devotees deserve all kinds of merits by having her vision. Those who adore and worship her selflessly are relieved of all distresses and turmoil. They will enjoy prosperity and pleasures. Mother Kaalaraatri is the destroyer of demons, ghosts, goblins and evil-minded persons. All planetary hurdles are removed if a devotee chants her name with devotion. She confers the state of fearlessness on her devotees. A devotee should worship her with a purified mind and intellect in order to derive full merit of his devotion.